There are times when we walk in the wild and find something interesting. We look at it, and forget. Then there are times when we remember seeing it but not photographing it. That’s when we regret. I have been through such times, apparently not photographing something that is very common, but then thinking back and wondering if it’s so common, why didn’t I photograph it? On a dull winter day I was browsing on the web, where I came across a picture of an interesting centipede. I had photographed a similar fellow during monsoon in 2008, when I had been on a trail at SGNP (read it HERE). I came home and forgot about this image. It never appeared on my blog either. So now, more than a year later I dig into heaps of albums and find this one image. Now I know what it was and I wish I had taken more photographs. Everyone who has been on nature trails during monsoon has seen this bug. 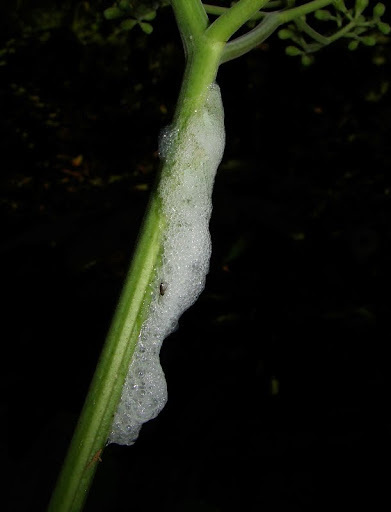 That frothy, spit-like “shelter” is built by a bug nymph. It’s not hard to recognize it once you see it. Spittlebug or Spit bug is very common all around Mumbai. These “spit homes” are more so common during post-monsoon months starting August to October. The frothy structure is not just a home, but a safe zone. It is itchy if it comes in contact with the skin, it keeps the nymphs moist and protect against heat and cold. The Spittlebug is in fact a larval stage of insects in the family Hemiptera – the true bugs. 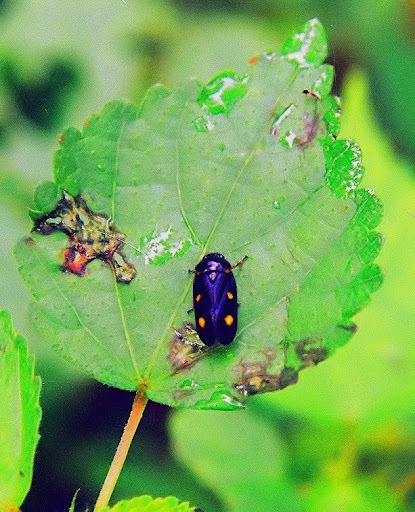 The adults are referred to as Leafhoppers or Froghoppers. The adults are easily distinguishable from one another compared to their larvae. The family Cercopidae is most abundant. The adults are as commonly seen during post-monsoon months as the nymphs. Some species are considered pests since they damage cash crops. The “Spittlebug” I find interesting is Callitettix versicolor. This mysterious bug is so common, it’s an irony that there is no information available on the internet. It belongs to Cercopidae, is a plant-sap sucker, and is most commonly seen during post-monsoon as are its other cousins. It is a beautiful conspicuous bug, fairly large in size compared to some Leafhoppers and prefers clinging onto grass blades. Although the nymph may be a pest, the adult is not known to be a pest on any plants, but there is a big lacuna in online literature on this fellow. There are several Cercopidae bugs unknown to us – with their real name buried deep in million different scientific papers. The above photograph was taken in 2006 with an SLR. It is probably a Cercopis sp. – another beautiful Spittlebug adult – seen at Karnala. Skippers (Hesperiidae) are my favorite butterflies because of their cryptic appearance, and the fact that identifying them is tougher than identifying the Blues (Lycaenidae) butterflies. These butterflies are small, commonly seen during monsoon and post-monsoon, and love shady forests. The Hesperiidae of Mumbai is well documented, but there is little information available on some. Vindhyan Bob is of particular interest to me because of its mystery. 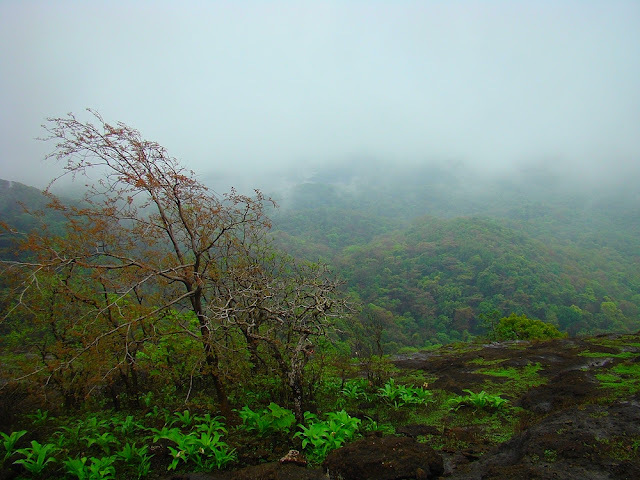 It is seen throughout the seasons, but is most common during Monsoon months. This little skipper has baffled scientists for its multiple seasonal forms that are confusing. The different seasonal forms were long thought to be different subspecies! But that’s not it. 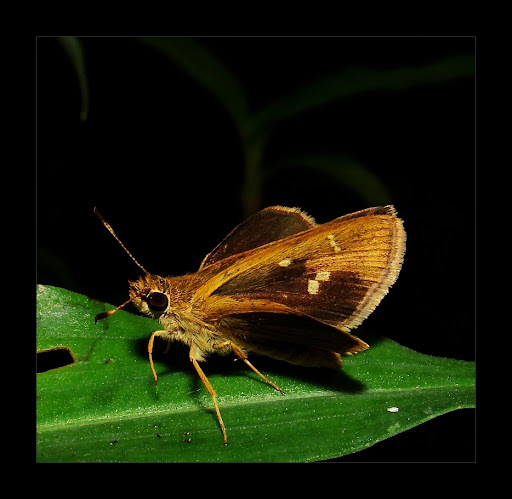 This endemic skipper of Western Ghats is one of the commonest skippers seen in Mumbai – particularly SGNP – including Yeoor and some part of IIT-Campus. The sad part is – its life history is unknown to us. There are no records on its larval host plant and larval stages. However, we can speculate how the caterpillar might look and which food plant it might prefer based on its cousins in the same genus, but the fact that this endemic butterfly of ours is still unknown is the reason why I included it in Little Known Bugs of Mumbai. There are several successful butterfly rearing enthusiasts, who I hope will one day find a mysterious caterpillar that belongs to Vindhyan Bob. Until one of us hunts it down, we can only wait. 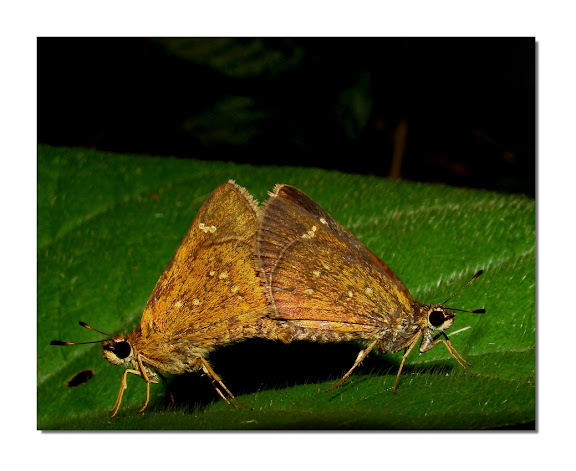 I have seen a mating-pair during monsoon of 2008, but that’s just one-fourth of its life cycle. Derbidae is a family of bugs belonging to Hemiptera. 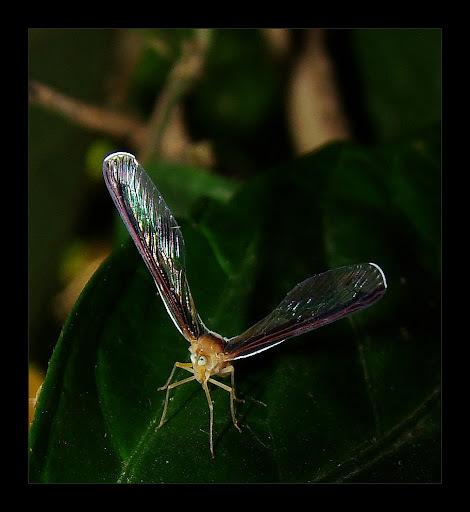 The bug I am interested in is called – Derbid Planthoppers. It belongs to genus Proutista. I like to call it rabbit-eared fly. This bug is fairly common in all seasons if you have an eye for nature. It is mostly seen on palms, specifically Coconut palm, but also prefers shaded forests. These bugs are plant sap-suckers in their adult stage, the nymphs are known to feed on fungi. There is another big lacuna on literature of these bugs. Seeing them in Mumbai is common, but seeking information is not. 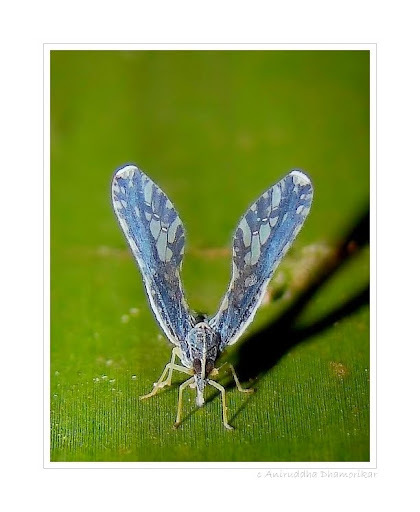 It is related to the planthoppers, as its name signifies, but they hold their wings straight up. They are cute, little interesting bugs that I know very less about. These flies are as common as Robber Flies. What’s not common is finding enough information on them. 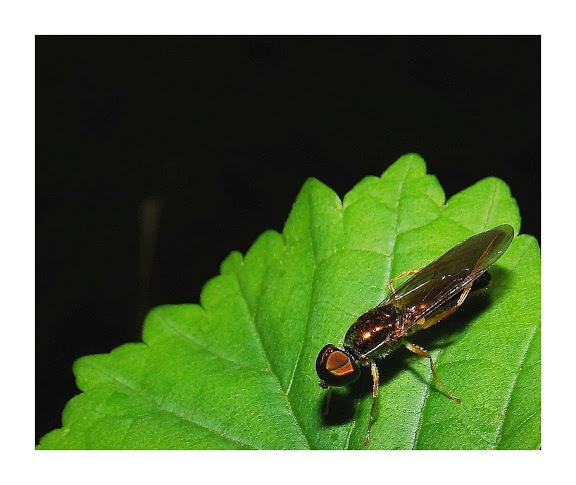 These are metallic, elongated flies with large eyes, covering most of the head. They are seen throughout the seasons. The soldier flies, specifically those found in Mumbai (or India) have no information available on the internet. But a quick search on Soldier Flies earns a good deal of information. These flies are excellent mimics of wasps and bees. 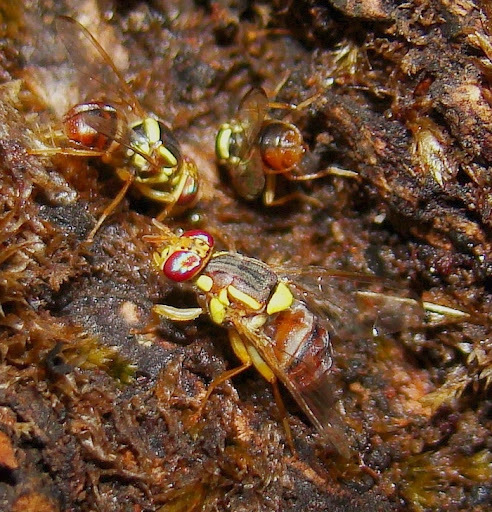 They belong to Stratiomyidae, a diverse family of flies. The most common I have seen is Sargus sp. 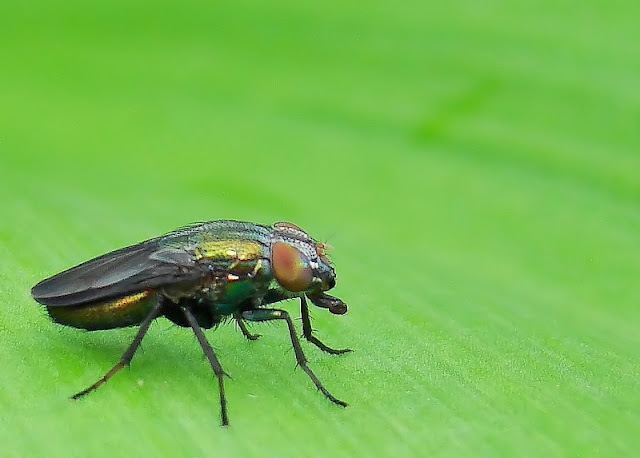 This fly is most common of all, which is seen on most nature trails sitting patiently on leaf surfaces. The flight is very fast, to-and-fro, but they do not fly far off once disturbed. * This fly is now identified as a Melon-fly, Dacus sp., from the family Tephritidae. They are known to be serious pests on melons. Adults lay eggs under the "skin" of fruits, and larvae bore tunnels inside, thereby making the fruit rot sooner. Let’s accept the fact that we don’t like observing flies as much as we like butterflies and spiders. There are several fly families that go unnoticed, but not all. The flies of the family Milichiidae are as common as spiders – because, where there are spiders – there are these flies, entitled Kleptoparasitic flies. Kleptoparasitism is a form of parasitism, where one animal takes prey or food from another that has caught, collected or prepared the food – including stored food. The prey may not be stolen from its predator, but merely fed upon without predator’s consent. The Melichiidae flies are one best example, where they feed off the prey captured by other insects or spiders. A Lynx feeding on a Honey Bee. Can you spot Milichiidae flies in the above picture? This sort of behavior has been documented and photographed by many at SGNP. The flies hover around spiders and sit on the prey a spider is feeding on. 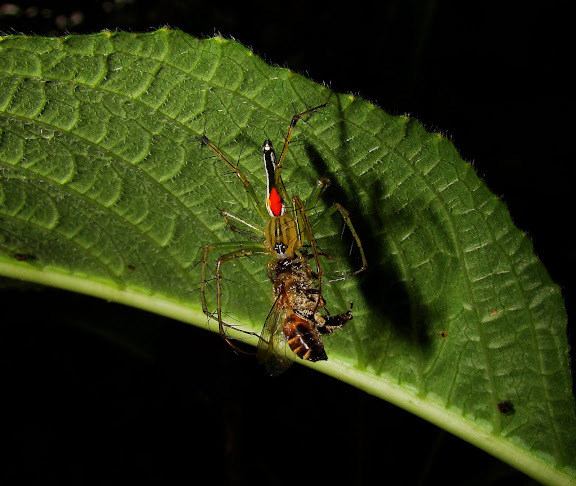 This parasitic behavior ultimately gives the spider less nutrients, since the flies feed off the free food, sadly avoiding these flies is impossible. There are several fly families that are kleptoparasitic, and Milichiidae is only one of them I have observed and photographed in SGNP. 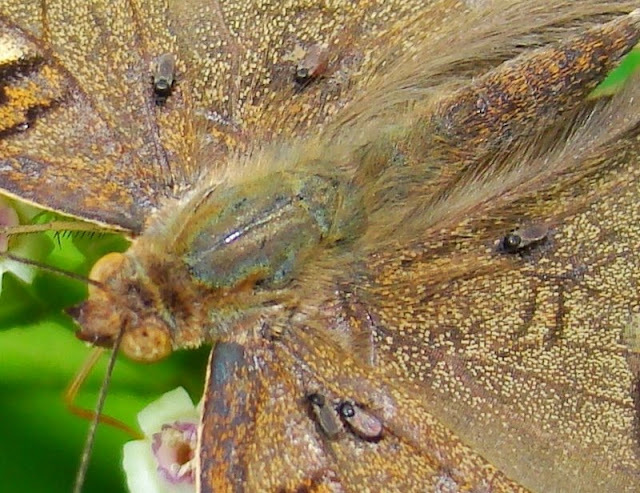 The flies sitting on this Lemon Pansy butterfly could probably be parasitic, but I have no idea – and never came across information on this kind of behavior – they are probably just hiking a ride ‘cause they are too lazy? Or are they parasitic? One rare creature of the ground, soil centipedes are not that rare underground. It was this interesting centipede that made me wonder how many other creatures I overlooked in the past. I do not have a thing for centipedes, but a soil centipede is nothing like the ones I am afraid of. 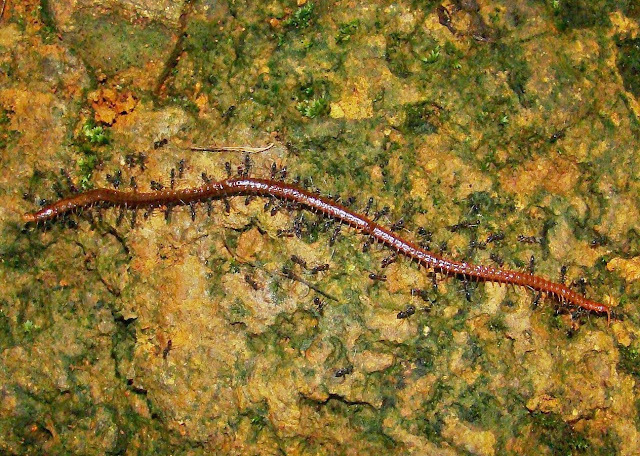 Soil centipedes belong to Geophilomorpha – an Order under Chilopoda (Centipedes). They dwell underground or under rocks and are eyeless. These centipedes feed on bugs in the soil and are considered beneficial to the ecosystem. Seeing one above ground is rare, unless you turn the rocks or dig underground. Some species occur commonly in gardens, even plant pots, but that’s all we know about them. The soil centipedes also show an enormous lacuna in its information availability. The only reference I collected related to Indian Geophilomorpha was “Contributions to knowledge of the Chilopoda - Geophilomorpha of India” which is unfortunately not available online. Many studies conducted abroad on Soil Centipedes cite the above reference, which is a clear fact that it is a priceless study on Geophilomorpha of India. It is our misfortune to not be able to find the document. An unknown fly (probably Stomorhina sp.) or a deformed Chrysomya sp.? The little known bugs are several that include spiders, moths, ants, beetles, bees and other insects. This is just a touch-up on the ones I find interesting, but know little about. Whether we will get know them or not is uncertain, since it might be too late to learn if all the habitats as we know fall under a serious threat. The current state of the habitats is not something I would argue upon. We all know what happened to Uran – a bird paradise, or we know what is happening to the mangroves elsewhere – or with the constant encroachment into the last forests of Mumbai, and we all regret on what’s happening and can do nothing about - simply because we-don’t-know-what-the-hell-we-can-do-without-getting-involved-with-police-and-politics. By studying these animals, we will not only learn a bit more about the biodiversity of our surrounding, but it will be easier to assess the health of the ecosystem. These little flies and other creatures are at the base of a large food pyramid. The larva of Soldier Flies grow in damp, dead and decaying wood – excellent for breaking down the wood and passing the nutrients into the ground. The Milichiidae flies somehow control the extent of spider’s reign over the flowers (in place of bees). The Spittle bug larva and adults might be pests, but they also feed on weeds! Every organism is an indicator of the health of a habitat. Let’s look further into the thickets and find these creatures, and let them have their share of fame for the little but wonderful work they do to keep our planet going. What does your “Little Known Bugs” list comprise of? I just came across your blog and I just wanted to let you know how much I like it! Fantastic photos, and thanks for showing some insects from Mumbai, especially the Diptera! I look forward to seeing more of your future work! I'm an entomology grad student at the University of Guelph and have a blog of my own if you're interested in seeing some of my work, both scientific and photographic!